Ooh I am so excited to share this recipe with you. 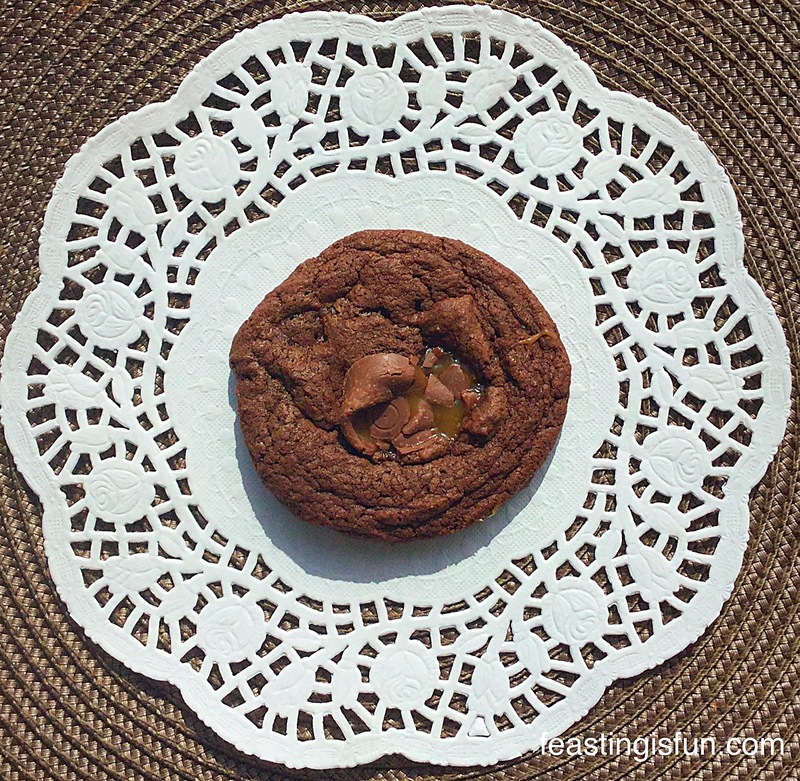 I may, have just found the perfect chocolate/caramel cookie! 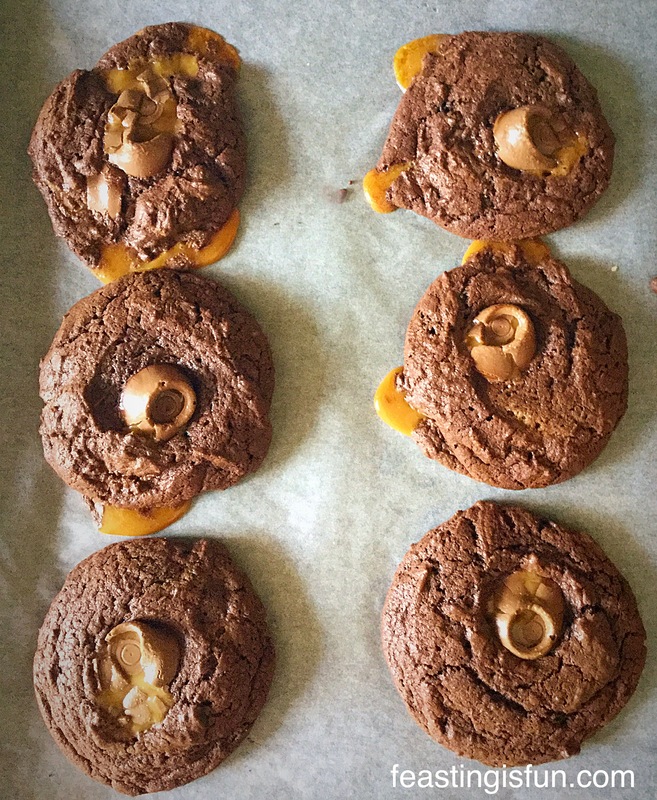 Meet my Rolo Chocolate Cookies. Since I have been wanting to make these cookies for absolutely ages, I finally got round to it yesterday, while I was also baking my Chocolate Orange Citrus Bundt Cake. 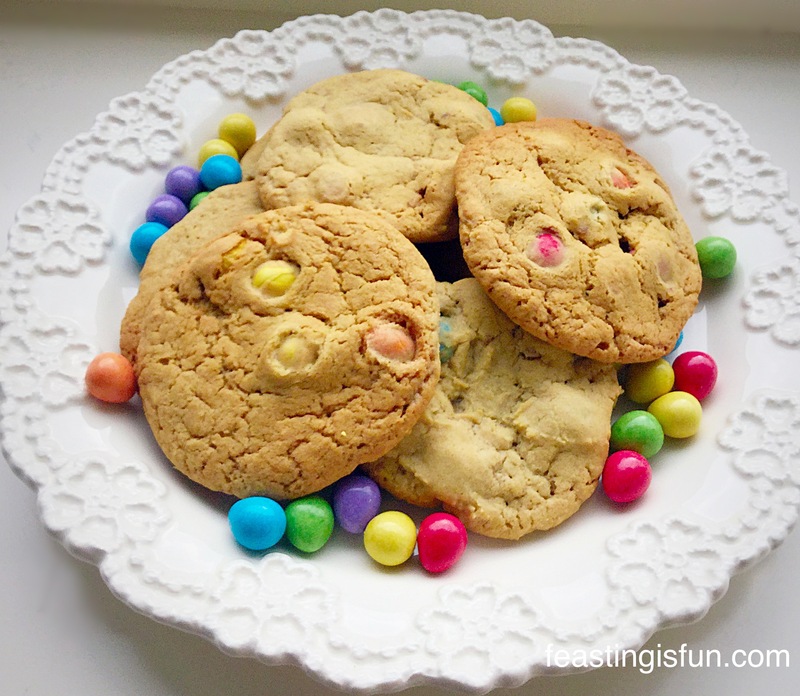 While using the recipe from my Monster Mini Egg Cookies as a starting point, I jiggled things about a bit. Especially changing from light brown sugar to dark muscavado sugar and adding some cocoa, amongst other things. Resulting in my humble opinion, the best soft chocolate cookie that I’ve made so far! Rolo Chocolate Cookies unbelievably good. 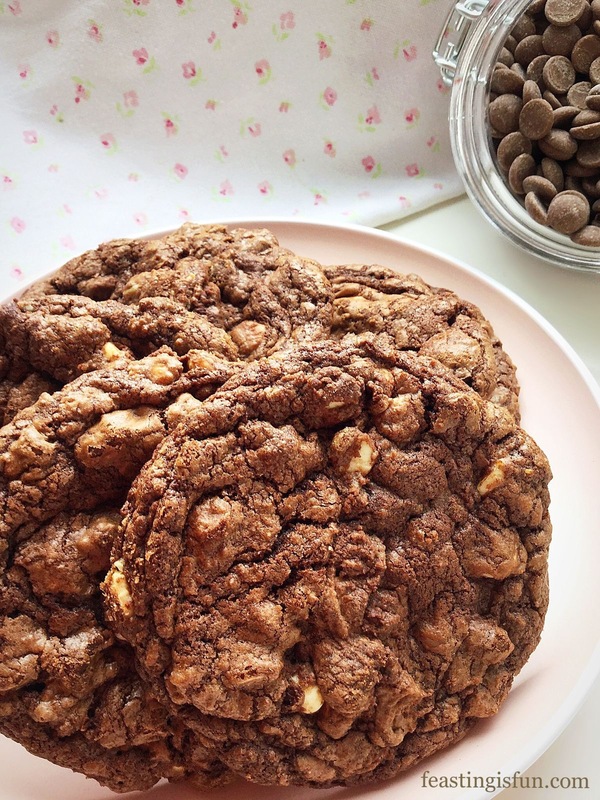 Oh my, these Rolo Chocolate Cookies are the stuff of dreams. Or to put it in the words of our children, like the ones you get at Sainsbury’s! The difference being that I know exactly what has gone into these cookies and their smell as they are baking. 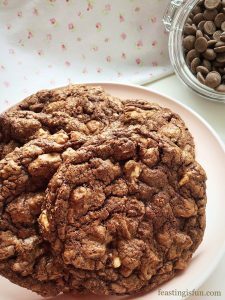 As you may know, I adore the smell of fresh bread baking in the oven, chocolate cookies are right up there with the bread, in terms of deliciously teasing aromas. Rolo Chocolate Cookies they really are as good as they look! 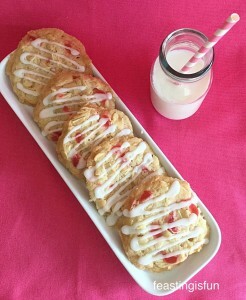 Because I am a self proclaimed Cookie Monster, sometimes I want a nice crisp biscuit that I can dunk in my cup of tea like my Lemon Shortbread Cookies and other times I want to bite into a soft, yielding cookie. 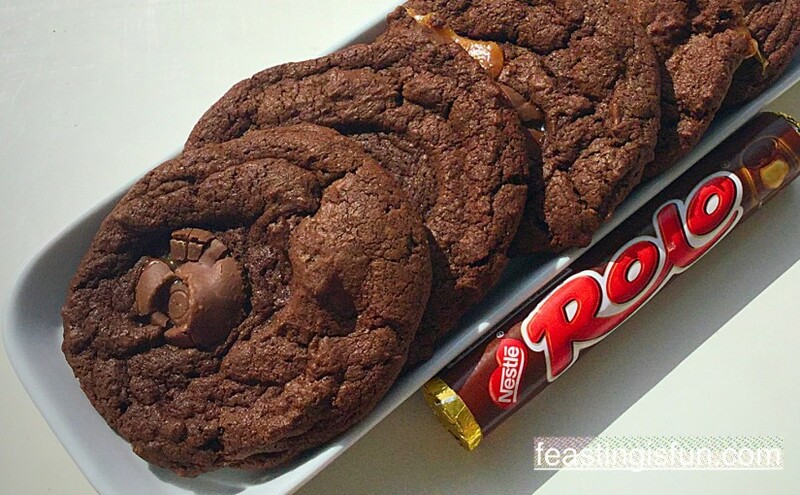 Exactly the type of cookie that goes really well with a glass of ice cold milk – these Rolo Chocolate Cookies are it. Yep I know that sounds like cartoon characters 😉. 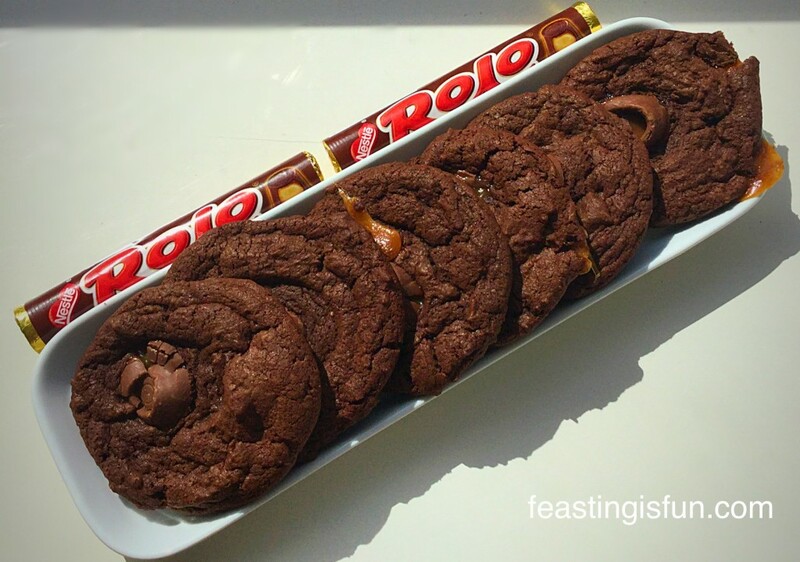 If you like chocolate cookies, then you’ll love these Rolo Chocolate Cookies. 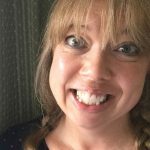 4-6 packs of Nestle Rolos – depending on how decadent you want your cookies – I’m not going to lie, I went for the full 6 packets!!! First of all place the sugar and butter in a large bowl and whisk for 5 minutes until pale and creamy. 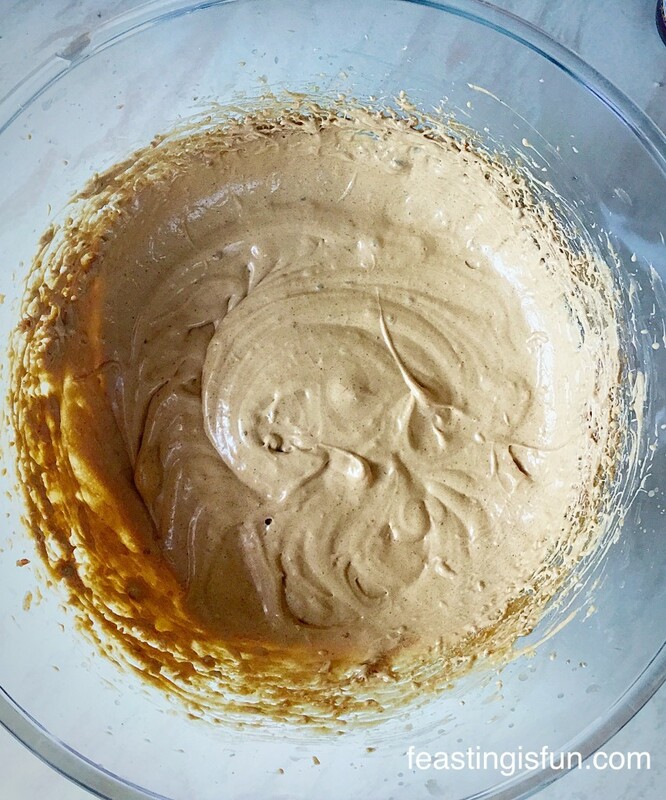 Importantly whisking for 5 minutes and then again after adding the eggs is very important to the finished texture of the cookie. Add the vanilla bean paste and the eggs and continue whisking for a further 5 minutes. This is how pale you need the whipped eggs, butter and sugar to be. Sift in the cocoa, flour and bicarb. into the bowl. Add 4 packets of Rolos. Everything in the bowl ready to become Rolo Chocolate Cookies!! 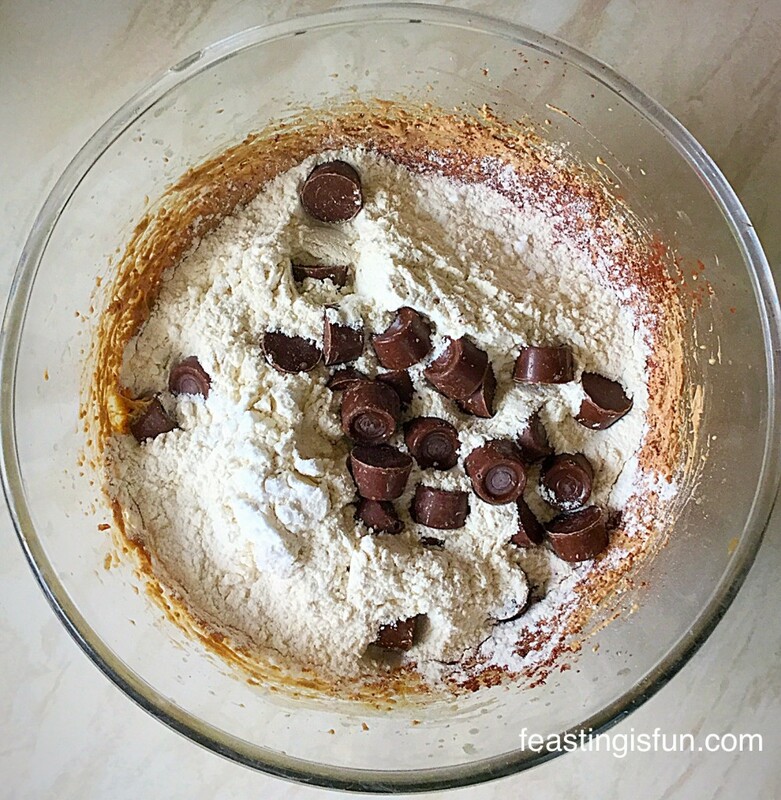 Using a metal spoon, gently stir all of the ingredients together, trying not to bash the Rolos too much. Using a medium sized ice cream scoop, scoop mounds of cookie dough onto the baking trays. Leave a decent gap between each mound as these cookies spread. Top each mound of cookie dough with an extra Rolo. Bake the cookies in the centre of the oven for exactly 15 minutes. The cookies will still be very soft after the baking time has elapsed. 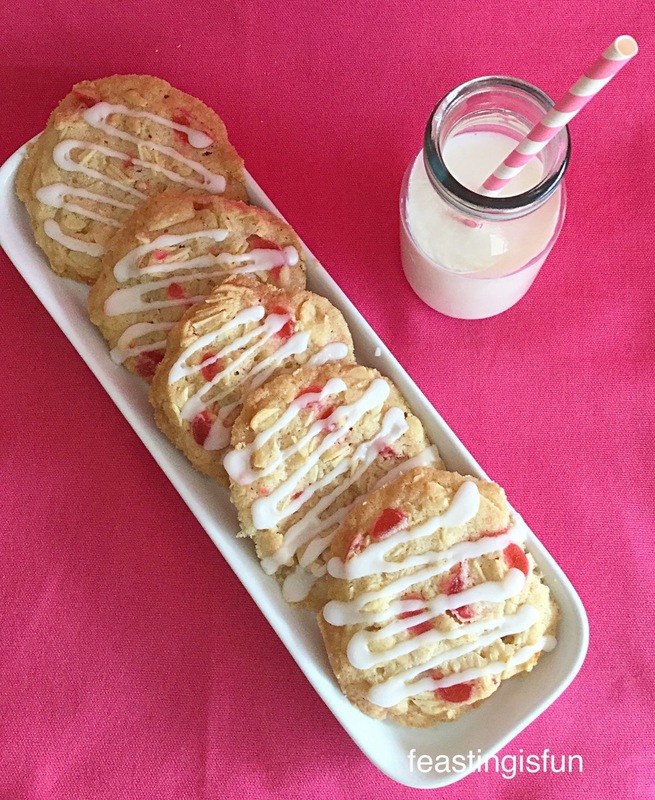 As soon as the cookies are baked remove from the oven and allow to cool completely on the baking tray. Rolo Chocolate Cookies cooling on the baking parchment lined trays. Once cooled store the Rolo Chocolate Cookies in an airtight container. Separate each layer with baking parchment. 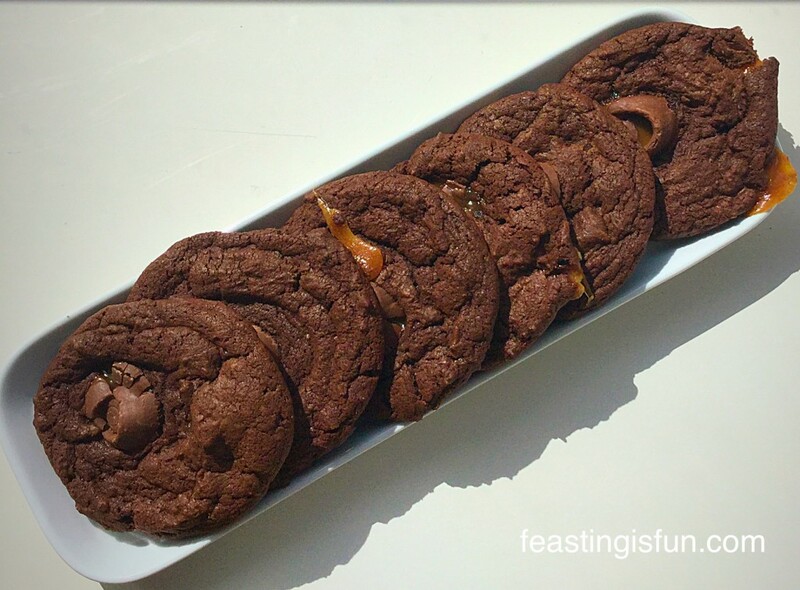 These cookies can get very sticky where the caramel oozes out and like to hang on to each other in the tin. I tell you this from experience 😉. 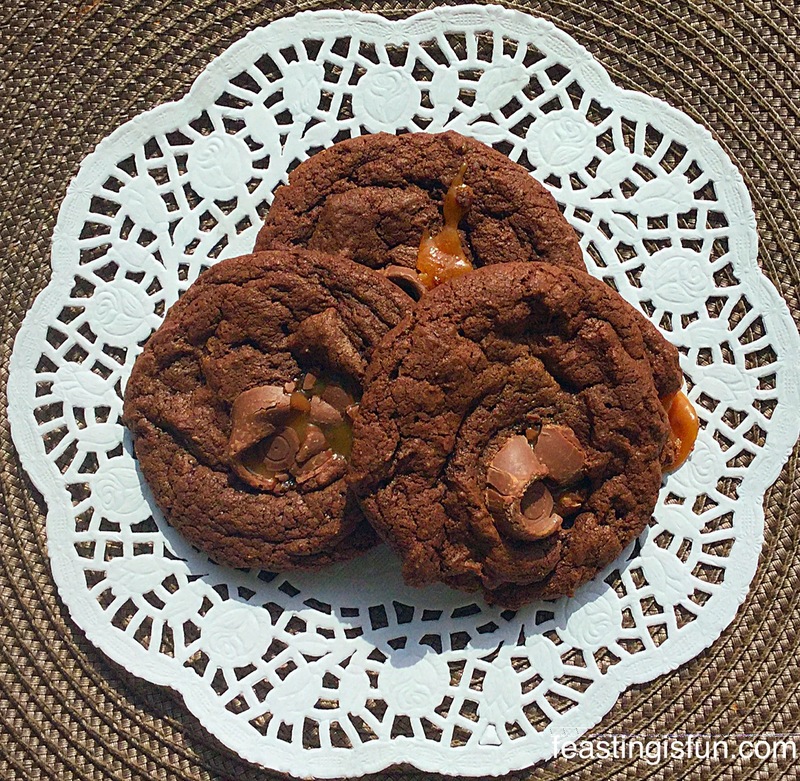 Rolo Chocolate Cookies a delicious combination of chocolate and caramel in a cookie. If you have any Easter chocolate left, you could break it up and add it to these cookies instead of the Rolos, or melt it and use it in my Chocolate Fudge Brownie Bites. 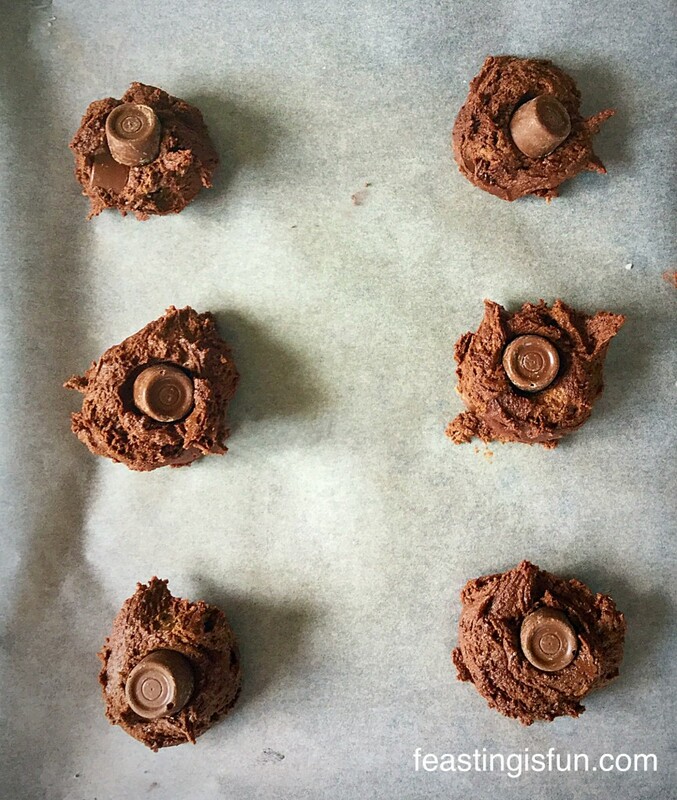 If you had a look of horror on your face when I suggested ‘leftover chocolate’ fear not I happily bought the Rolos for these yummy Rolo Chocolate Cookies!! In our home we have have an ‘eating chocolate’ stash and a completely separate ‘cooking/blogging chocolate’ stash. Although sometimes the lines are blurred – when the need arises, either way! Can you keep chocolate in the house without it constantly ‘calling to you’? I love reading your comments so please keep them coming. Also if you are on Twitter or Instagram please pop up a photo of your bakes and kitchen creations and tag me in. I enjoy seeing what you’ve made and will be sure to retweet or give you a shoutout. Whatever you are making or baking, have fun and remember food always tastes better when it is shared.